The Chinese Culture Center in Cairo is the first large-scale culture center set up at overseas by the Chinese Government in the 21 century. 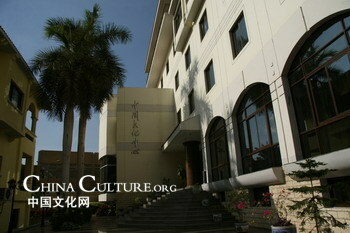 On October 29, 2002, Chinese Minister of Culture, Mr. Sun Jiazheng formally inaugurated the Center. The Chinese Culture Center in Cairo is aimed at introducing and promoting Chinese culture and arts; further strengthening the bilateral exchange and cooperation in the various fields of language, literature, education, and scientific research; facilitating the implementation of the Bilateral Cultural Accord and thus further enhancing the friendship and cultural relations of the Chinese and Egyptian peoples. The Chinese Culture Center in Cairo is located in the Giza District in Big Cairo, with the Great Pyramids seen from afar. The Center covers an area of 2000 square meters. Inside the main building in the Center, with one floor underground and 5 floors above, there are the multi-function hall, the exhibition hall, classrooms, language lab, library, reception room and dining hall. It is a very modern construction equipped with advanced facilities and has multiple functions. Multi-functional Hall: Located on the ground floor of the main building, the multi-functional hall covers an area of 200 square meters and can hold 120 chairs at one time. The minitype stage inside the hall is made of wood and equipped with professional lighting and sounding systems, which is fully qualified for small-scaled performances and high-qualified film showing, or can be used as the dais for conferences and meetings. Balls can also be hold inside the hall. Exhibition Hall: Located on the first floor of the main building, the exhibition covers an area of 88.8 square meters, with 63-meter-long exhibiting line and 34 professional shooting lights. Foldaway wood wall is installed in the hall, which can separate the exhibition hall into two parts when necessary. There is also a dais inside the hall, which can be used both for teaching and exhibiting. Classrooms: There are totally 2 classrooms located on the first and the second floor respectively. Opposite to the exhibition hall, there is the small classroom with 24 seats, which is mainly for daily teaching. While on the second floor, the big classroom can be found. Besides class teaching, seminars and other kinds of small-scaled activities can also be hold here. Language lab: In order to standardize the Chinese language teaching by the Chinese Culture Center, a language lab with 24 seats is installed inside the Center. Modern equipments are set up in the lab, which will effectively improve the quality of teaching. Library: The library is one of the most important establishments of the Chinese Culture Center. It is consisted of two main parts: the reading room and the stack room. The reading room has an area of 102 square meters, which can hold 60 persons at one time. There are various kinds of books, magazines and audio-visual materials displayed for lending. A computer for indexing the books with Internet access is also provided to the readers. The Stack room takes up an area of 44.4 square meters with the feature of intensiveness. The stack room is inlaid with two parallel rails on which 10 separate bookshelves can move manually as what people desire. The designed volume of the bookshelves is 50.000 pieces. Now 12.000 books covering various fields like social science, natural science and etc., are available for borrowing. Reception Room: The reception room is located on the ground floor inside the main building of the center, which can hold 15 guests at one time. The decoration of the reception room completely follows the characteristics of Chinese Culture. The yellow wood floorboard echoes with the golden crystal hanging light, which sets off the classical atmosphere of the reception room. Dining Hall: Opposite to the reception room, there is the dining hall, serving the purpose of treat the honor guests. The decoration of dining hall strictly follows that of the reception room. Functions Ever since the inauguration, the Chinese Culture Center commits itself to further enhance and strengthen the Sino-Egyptian cultural relations. Through various activities conducted by the center itself or cooperated with local organizations, the Egyptian people are getting more and more familiar with Chinese culture and arts. Chinese Language Teaching: The Chinese language course will be the focus of the daily work of the Center. Seeing the upsurge of learning Chinese in Egypt, Chinese Culture Center will start Chinese Language teaching class, employing highly professional teachers with certain certificates from China. Books Lending: Based on the books available and considering the local practice, the Chinese Culture Center will draw out relevant regulations and makes the full use of the books resource. Simultaneously, modern multi-media means will be adopted to establish the on-line library in order to serve the readers in an easier, faster and comprehensive way. Small-scaled Activities: Diversified activities will be organized by the Chinese Culture Center in the way of self-operating or cooperating with local institutions, in line with the principle of small in scale, various in form and rich in content. For Example, inviting Chinese arts troupes to perform in the Center; holding exhibitions; organizing seminars, lectures, receptions and symposiums, and etc. ; taking full advantage of available resources to play films. Through all these kinds of activities, the Chinese Culture Center will endeavor to deepen the mutual understandings of the two peoples and try to figure out a fine image of Chinese culture.